Pasta is such a convenient food and it’s made in a million ways all over the planet. Accordingly, it will taste everything from boring, to vibrant, from disgusting to heavenly. Don’t believe anybody who tells you they don’t like pasta. Most likely they have not tasted the real thing. Sorry to be smug, but the real thing is made and cooked like Italians do. We do so few things really well in this crazy country. Pasta is one. However, even if you don’t have it in the genes, you can make magic with our national starch. Let’s see, did you buy good quality, durum-wheat, bronze-drawn spaghetti? Even better, did you just make some fantastic noodles or ravioli? Did you make some sauce? Fine. Now you need a really large pan, better a tall stockpot, water and salt. You also need a shallow pan to assemble sauce and pasta. For this purpose, I prefer to use a wok-like pan which in Italy is called saltapasta. The key to a perfect pasta is to keep it at a high temperature throughout cooking, saucing and serving. Use lots of water, typically 1 lt per 100 gr (1 quart per 3 oz) of dry pasta. Only start cooking the pasta when the water is on a rolling boil. You need to keep it at a high temperature so it cooks as fast as possible. As a result the pasta will keep its shape and texture (al dente). Use lots of salt, about 1 teaspoon of salt per lt (quart). Pasta cooked in unsalted water will be bland no matter how much salt you add to the sauce. I know it looks like a lot of salt, please just try and taste the difference. Keep the starch. During cooking pasta releases starch in the water which will provide a creamy texture and help the sauce clinging to the pasta. To retain the precious starchy film, don’t rinse the pasta after draining. On the contrary, you need to reserve some of the pasta water for the finishing (see below). While your pasta is cooking keep the sauce warm in the saltapasta or similar pan. Fresh pasta will cook in 1 to 3 minutes, dry pasta will cook in 6 to 12 minutes depending on package instructions. If you don’t overcook the pasta, there is no need to add oil to the water. As soon as the pasta is cooked, drain and transfer to the sauce pan. You actually need to drain it a good half a minute before is cooked as you will finish it while saucing. Increase the heat and stir the pasta into the sauce. 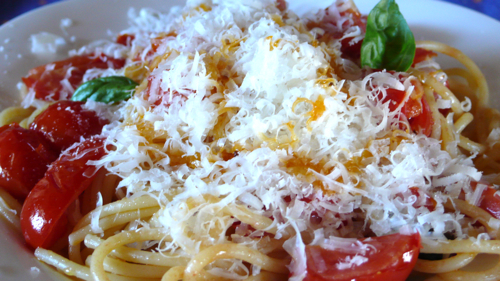 Add the pasta water – up to one tablespoon per person – and grated cheese, if using. Stir some more until the excess liquid is absorbed. Sprinkle with fresh herbs and a drizzle of good extra virgin olive oil. Serve on warm plates at once. And please remember, no swimming! I have never heard the tip about saving some of the water- I will have to try it! Thanks! I cannot imagine never eating pasta .. and one of the best tips I ever learnt was Salt your pasta water .. and always add the pasta to the sauce .. and buy a good quality pasta too. I’m never sure how much water to reserve, or how long finishing should take, so this is very helpful! ciao Sandra, that’s why I have made the video. When the sauce is like a cream coating the pasta is time to eat it! This is so wonderful to be able to watch exactly how to do this ! I am definitely making these on the weekend. Thank you, I am sure they eat a lot of pasta in Argentina! Go take a look at my ” Monday Look at this Blog “..
You are my “Guest Blog” ! thank you Candice, lovely post! Hi Letizia….great post and I love the pasta pot…..I’ll have to purchase one of those I love the built in colander! Hi Lisa, yes, the pasta pot is great, particularly if one cooks different types or batches of pasta in one meal. In fact you can reuse the boiling water. The video is wonderful and helps me understand how to sequence the ingredients – bella, bella. I see all of my previous mistakes with pasta! It is the one thing I wanted to learn how to make, cook and serve when I was in Italy 2009. Please make a video about how to make fresh pasta. Hood and I are bringing another group of students to Rome May-June 2011, and if time and money, would love to get to Umbria and you again. We are still enjoying the lovely olive oil from your friend’s shop, since we had several gallons shipped to us. My best to you and your family, and maybe we’ll see you in May 2011?? lovely to hear from you! I am so happy the video is useful. I am definitely planning to make a few more videos in the winter and making fresh pasta is always popular. I am happy you enjoy the olive oil, this year the oil is particularly good I find. Hopefully we’ll meet next spring!